2into3 are delighted to have begun the next round of the fundraising strategy developing workshop series. Over the course of ten sessions, 2into3 will assist three organisations in developing their own fundraising strategy. 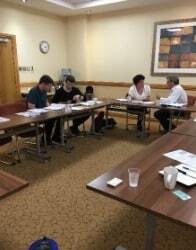 The first workshop was facilitated by Amy Power, 2into3 Consultant, who is a specialist on fundraising strategy development and the fundraising landscape in Ireland. During the workshop, participants were given an overview of the philanthropic landscape in Ireland, as well as key definitions and theory surrounding fundraising. Furthermore, the fundraising strategy output was presented in template form. Each organisation will be inputting into this over the ten workshops to develop their own bespoke strategy. As one size does not fit all, the intricacies of the individual organisation’s fundraising strategies will be developed over the remaining workshops. For more information about the Fundraising Strategy Development Workshop Series, please contact Amy Power, Consultant, on Amy.Power@2into3.com or 01 234 3165.